Complete satisfaction, delicious food and friendly service is our commitment to you. The law firm I work for had Hola Paella cater our Staff Appreciation lunch today. The food was amazing, and people who didn't ordinarily like certain foods ended up loving them. The date/goat cheese/walnut appetizer and the tomato/cheese/sausage appetizer were fantastic (people who don't even like dates were gobbling them up!). We had three different paellas - all meat, seafood, and vegetarian. I had the latter two and loved them. They piled the plate so high I wasn't sure if I could finish it all, but I did, and ended up getting a small second portion of the vegetarian one. The salad they served was equally amazing, a mixture of super fresh field greens and walnuts and one of the best dressings I've ever had was already on the salad in the perfect quantity - just enough, not drowning in it. Fernando and his wife are wonderful people who seemed very relaxed while preparing food for 75 of us. If I can think of a way to have them cater an event for me, I will definitely be contacting them, and you should too! I was simply a guest at a party catered by Hola Paella this Saturday, so I can't speak to the business details - but I have to say this was the most memorable and delicious food I have ever experienced at a private event. It was exciting to be able to go into the garden house and watch the paella being assembled. The garlic! I was in heaven. Fernando is a real charmer, and an obvious talent in the kitchen. And when it was served up - incredible! I was somewhat shocked to see the massive portion that I was given (I'm a light eater) and then... I ate it ALL. I even considered seconds. Complex flavors, bright textures... the best paella I have ever tasted. And get this: I chose the vegetarian option. How did they do it? How did they make veggie paella REAL paella? And the best ever? Even though I watched them create it, I'm still not sure. Those little chorizo skewers were to die for, as well. Bottom line - if you hire them, I know you will be happy, and if you are a guest at one of their parties, you are a lucky, lucky person. Salud! This review is far overdue, because we hired Hola Paella for our rehearsal dinner back in 2012. We started going through some pictures and remembered how amazing the food was! We were literally craving the paella again as we were going through all the memories. I can't recommend them enough! The appetizers were delicious and we are still trying to find paella as good as this. If you're smart, hire them now! It is simply the best! I never want to eat another Paella that isn't made by Hola Paella!!! The chefs are amazingly skilled and nice! Can't wait to throw a party and have them cater it! YUM! After tasting Fernando's paella the question on everyone's mind was "How is it possible?" How is it possible for the food to taste THAT good? How is it possible for the rice to be THAT tasty? How is it possible for the seafood to be THAT fresh? How is it possible for the calamari to be THAT tender? How is it possible for there to be THAT much food leftover? Fernando was great! He works better through phone calls so be sure to call him as well as email him! Prices are very reasonable with a minimum order for 10 (order is based on amount of food prepared not actual head count so you can actually invite more guests than said head count). Service fee is included but we loved him so much we gave him more. We told Fernando that one of the kids had a seafood allergy so he made a small veggie and chicken paella just for her (it could probably feed 4 people) without any additional costs. Wow! Who does that? We were able to chat with him a bit and he has a lot of his ingredients imported from South America and picks out the freshest seafood- I know my seafood since my whole family loves seafood and it was delicious! Posted a picture on facebook and now all my friends are drooling and demanding an invite next time. And yes there will be for sure a next time! Hola Paella catered our wedding in Pacifica last month and did a fantastic job. Our venue didn't have a kitchen on site, and after being completely shocked by the prices other caterers were throwing around, we decided to go another direction and contacted Fernando. I'm SO glad we did. Besides being very reasonably priced, everything was better than we hoped for - from the food to the service. We didn't have a chance to try the paella ahead of time, but as soon as we met with Fernando and his wife at the venue to do a walk-through, we knew we'd made the right decision. We had three kinds of paella (veggie, chicken, and chorizo/chicken) as well as an assortment of appetizers and tons of people raved to us about how delicious everything was. We felt that the servers really went above and beyond, from passing the appetizers (I didn't even know they were going to do that!) to always checking in with my husband and I to make sure we had everything we needed, they were all a pleasure to work with. Thanks, Hola Paella, you really helped make our wedding day special! Fernando was a pleasure to work with, and everything went smoothly. I was enlisted to coordinate the food for a coworker's 20 year anniversary at our company, and Hola Paella did not disappoint! When I called, Fernando was very kind and helpful with suggestions. We ended up going with the Hola Paella Special Paella Valenciana and a smaller order of another paella. We set the date and time and he sent over his invoice, so everything was set fairly quickly. A few days before, he called to confirm. I really appreciated that as it shows that every event, no matter how small or big, are important. 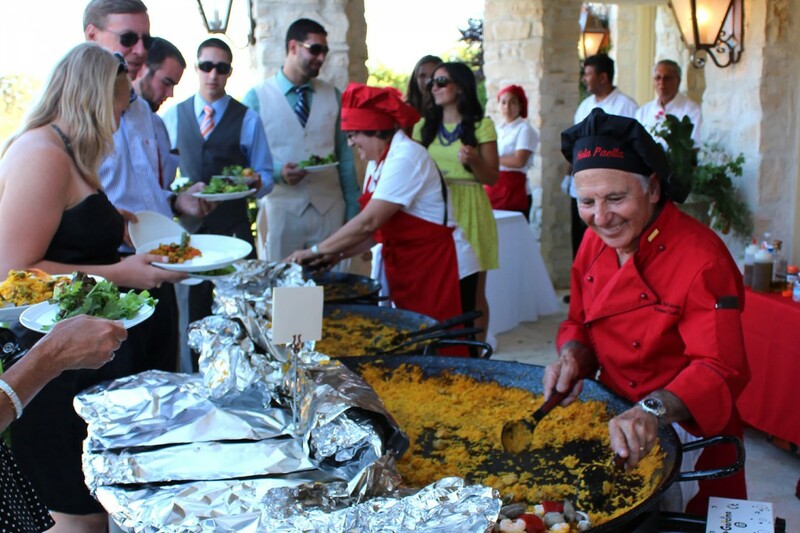 On the day of the event, he came right on time and got started cooking his delicious paellas in our gazebo. He provides everything - all the cookware and even utensils and plates for us! About an hour later, the food was ready and all my coworkers were super impressed with everything. Go me! LOL They could not stop raving about how delicious the food was. This isn't the normal type of catering either, so it made the event even more special. All the 5-star reviews are a testament to their great service and yummy food. I would HIGHLY recommend Fernando and Hola Paella to anyone looking for a fun, unique caterer for a party or special event. You will not be disappointed! I was so pleased with the hospitality of Fernando and his wife. They were so efficient in setting up the paella for our big party. It was awesome to see them cook it, and It smelled and tasted delicious! Definitely would have them again and again. I hired Hola Paella exclusively on the basis of their Yelp reviews, and I was not disappointed. Fernando and his wife are a lovely, professional, friendly team and our guests were not disappointed. My husband is a big paella fan, having tried some of the best in Spain, and so I decided to throw a paella party for his 40th. Hola Paella did a great job and I would definitely use them again. Wow..... I'm nearly speechless. I went to a friend's bday bash last night and Hola Paella catered the main course. I'm usually not a fan of paella since most places can't time the cooking process well. The chicken ends up tough, the seafood gets rubbery and the rice is either mush or over cooked or still gritty. Given the amount of ingredients with different cooking times, making a good paella takes major skill. The owner set up two huge paella cooking pans in the kitchen and got to work. The house smelled fantastic while he performed his magic. The seafood paella was amazingly fresh; prawns were large and juicy and the clams were cooked perfectly. The chicken was well seasoned and the rice was cooked al dente with socarrat. AMAZING!!!!! Now I just need to figure out an occasion to hire the Paella Man to cook for me again... It's a testament to his skills when the day after I'm sitting here drooling and craving paella. We have had Hola Paella cater three events at our home in the past few months--each was better than the last and they were all great. Fernando and Vicki are delightful, and very flexible--they are very willing to modify the paella to suit specific tastes--such as how spicy it is, ingredients and relative quantities, etc. We and all of our guests have been so pleased with these dinners. It is very fun to enjoy appetizers (the Hola Paella appetizers are also great) and watch them make the paella. The seafood is very fresh. Our kids enjoy the leftovers! I highly recommend this to everyone.